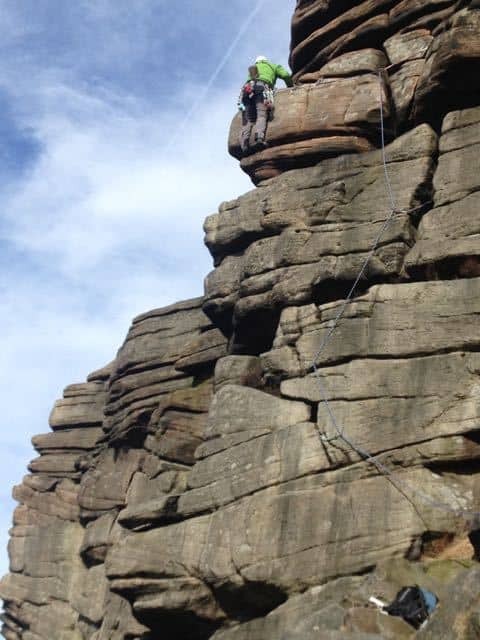 England is home to world class climbing; the gritstone crag of Stanage stretching for over a mile and the two-tiered crag of The Roaches in the Peak District, to the prehistoric feel of the sandstone towers at Brimham Rocks and the smooth, uniquely shaped limestone of Twistleton Scars nestled among the three Yorkshire peaks. There are few day trips better than being on a peaceful hillside with views reaching for miles down a picturesque valley, away from the hustle and bustle. 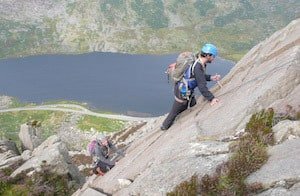 There are also the mountain regions of the UK which offer both climbing experiences for the complete beginner to extended vertical trips for the budding mountaineer. Locations such as Gimmer Crag, Dow Crag and Shepherds Crag in the Lake District and the towering Idwal Slabs and Tryfan in Wales. On visiting these inspiring, beautifully epic locations it is easy to see why the UK has been prominent in the history of mountaineering worldwide, that here legends were born that pushed the human limits. At Lost Earth Adventures our aim is to give you a thrilling and fulfilling day out on the rocks! We provide you with all of the tools, guidance and instruction needed to create a unique experience you’ll never forget. 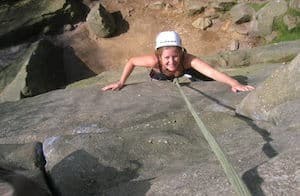 All of our rock climbing days can be run as private guided sessions for you and your group, giving you the freedom and flexibility to make your day your own. You can also choose to join one of our group sessions that are running throughout the Spring and Summer. Want more? 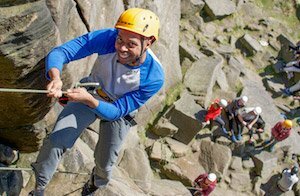 We can combine our climbing sessions with abseiling and weaseling, or for the full mountain experience we offer mountain scrambling and epic multi-pitch vertical climbs! 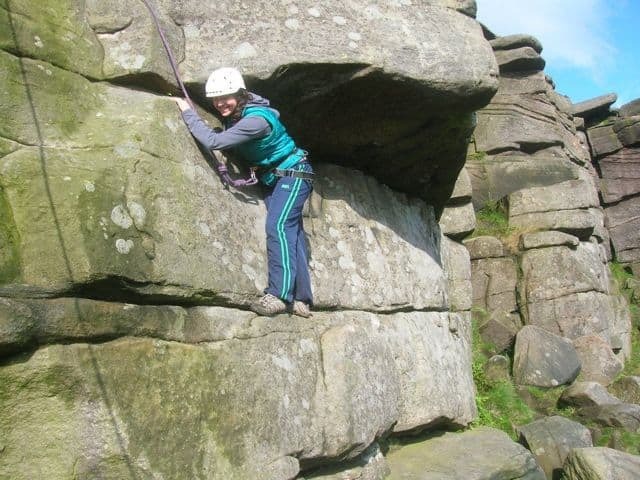 We offer half-day and full-day rock climbing experiences which can be done in the morning or afternoon, rain or shine. 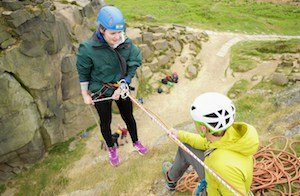 Our rock climbing and abseiling sessions are tailored to your aims and objectives so whether you’re a seasoned climber or you’ve been an armchair adventurer up until now, we can make your session fit you perfectly. We can also combine these with our other activities! Why not make it into a full day or weekend adventure? Find out more about how you can speed along mountain single-tracks, venture underground or through limestone canyons on our mountain biking, caving, abseiling, or gorge walking pages. 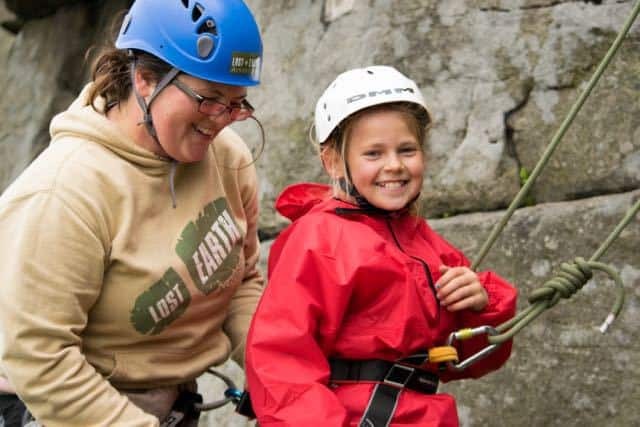 Call us on 01904 500094 or email us at info@lostearthadventures.co.uk to inquire about the climbing experience for you. 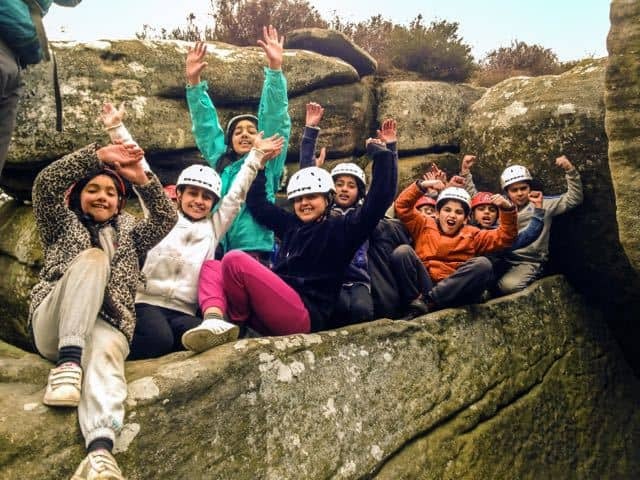 Rock Climbing is incredibly popular with large groups, helping inspire, educate and bring people together. It is an ideal activity for school and youth groups, team building and charities looking to fund raise. A perfect activity also for stag or hen parties and large groups looking for a fun day out that is thrilling, different and memorable. To find further information specific to your group, click on the Groups tab below or contact our team. To make things easy as we know large groups are hard to organise all we need is a £50 deposit to reserve the date. The final balance is not due until 30 days before the activity takes place. Deposits are non-refundable but the date can be changed with 30 days notice, subject to availability. 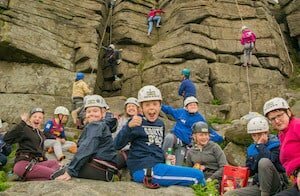 Climbing courses and fun days out are flexible to suit all experience levels with options available for both groups and individuals. To see some of our climbing venues check out our locations tab above. 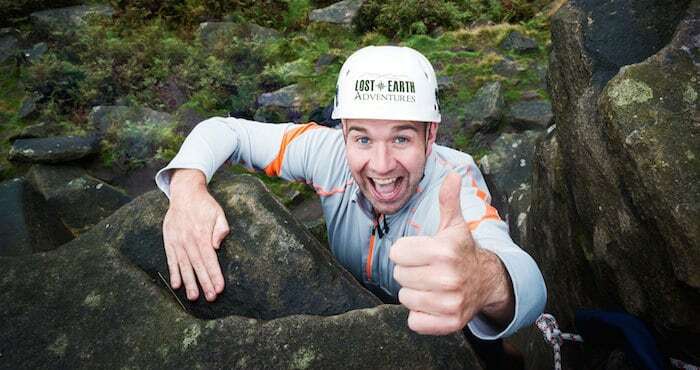 At Lost Earth Adventures our aim is to give you a thrilling and fulfilling day out on the rocks! We provide you with all of the tools, guidance and instruction needed to create a unique experience you’ll never forget. All of our rock climbing days can be run as private guided sessions for you and your group, giving you the freedom and flexibility to make your day your own. You can also choose to join one of our group sessions that are running throughout the Spring and Summer. Half day, full day and multi-day climbing is available.On all ascents and descents you will have a safety line attached to you keeping you safe. 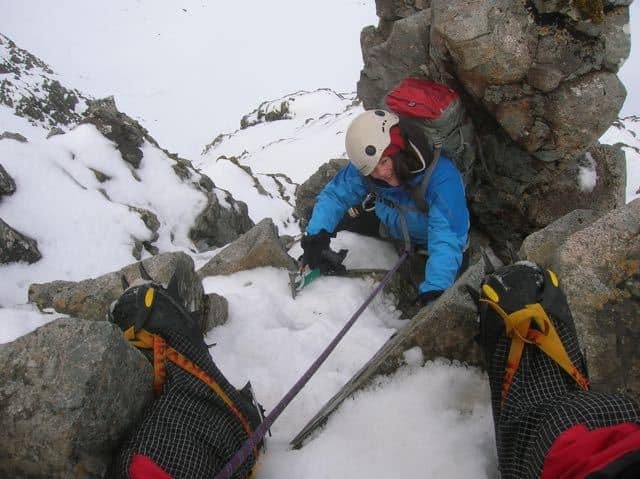 For those wanting more we also offer full mountain experiences in regions such as the Lake District and North Wales. Whether you want to summit a peak via a rocky ridge or climb an epic multi-pitch vertical wall, our experienced and knowledgeable guides can accommodate your ambitions. Let us know what you want to do or where you want to go by contacting our team and we’ll make the perfect trip for you. If you’re interested in bouldering we can get you started. 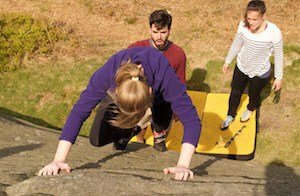 We offer experience days and bouldering courses that cover movement training. We will explain the correct techniques and best practices to enjoy the sport safely. Bouldering can be enjoyed at most of the venues listed above but you’d be best to speak with us, explaining what you’d like to get out of your day, so that we can get you to the right place with the right instructor. 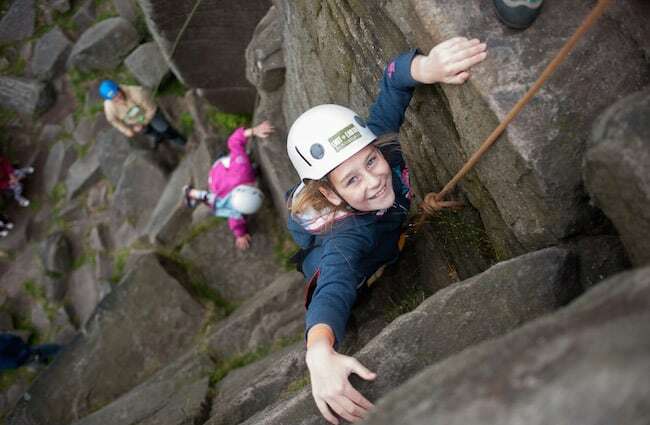 Ever fancied having a go at abseiling? Then look no further! We can arrange a thrilling day out for you and your group whether it’s for charity or your own personal excitement. 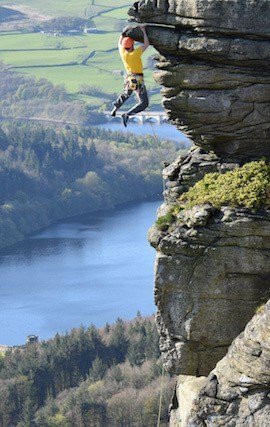 Abseiling can be arranged outside at a crag, inside at the climbing wall or even from your local church or office building! If you want a more educational approach, learning about outdoor equipment and how to use it safely then we have the course just for you! Our outdoor instructional climbing days are privately guided, giving you an excellent guide to client ratio. Our guides tailor the day to suit your aims and aspirations perfectly. All our instructors are fully qualified, highly trained and have been climbing outdoors for many years. 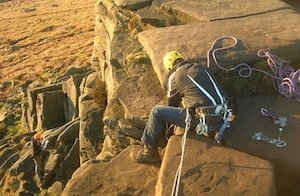 They can cover any aspect of rock climbing you are wanting to learn and their valuable expertise will give you a highly rewarding experience. 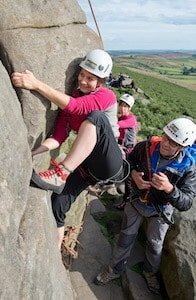 If you are new to climbing and want to give it a go and find out what it is all about our introductory rock climbing course provides a fun and informative experience. Our professional guides will help you every step of the way and be happy to answer any questions you may have. 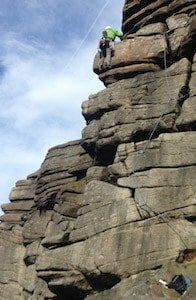 Climbing terminology, know your aretes, slabs and gritstone! This course is designed for someone whom has the desire and determination to lead climb on rock. You don’t need to have been on a previous course with us before, though this is an ideal progression from our other courses. Course locations run throughout the Peak District, Yorkshire Dales, Lake District, or the North York Moors. We recommend you bring several layers of clothing to provide comfort and flexible options throughout the activity, nothing too bulky or clothes that are expensive. A t-shirt or long sleeved t-shirt (technical, non-cotton shirts are best), followed by a sweater or a fleece top and a waterproof jacket. We do not recommend denim as it can restrict movement when climbing and is slow to dry in the event of rain. Jogging or cargo trousers are more suitable. Gloves or sun cream may be useful depending on the time of year and a warm beanie hat can help to keep warm, but this must be thin without a bobble to fit safely under our helmets. *We hope you remember your adventures for years to come so it is okay to bring cameras on our activities. However, please be aware that due to the nature of our activities, cameras and phones are likely to get wet and damaged so do try to waterproof and protect them sufficiently. We cannot be held responsible for damage of valuables. At Lost Earth Adventures we take safety very seriously. We have full public and product liability insurance, write risk assessments for every activity we offer and use highly experienced and qualified instructors with a good client to staff ratio. Lost Earth Adventures also holds an AALA license for the provision of rock climbing. This is the highest accreditation that is available from the British Government and means that we meet the high standards set for providing adventurous activities. Read more about our safety policy. 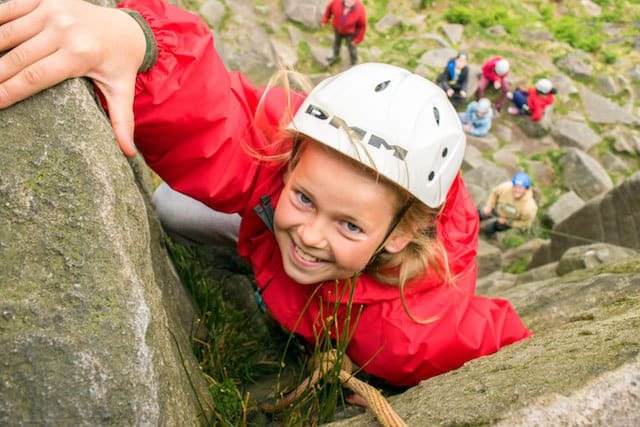 Children under 18 and older than 7 are most welcome to join us rock climbing but please let us know when booking how many and what ages they are. We have no upper age limit, as long as you have the determination and a sense of adventure! We will provide you with all the equipment you need and our qualified instructors will take care of everything else. Fancy a whole weekend of adventure? 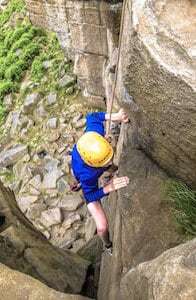 Combine rock climbing with caving, mountain biking, gorge scrambling or hiking throughout the peaks and hills of Yorkshire and the Peak District. If you are interested please read what’s on offer on our weekends away page. Natalie C. – Read more reviews. Want to climb somewhere else? If there is a climbing venue different to the places we have listed contact us to see if it is suitable for you and your group. We are very flexible and have a lot of climbing venue knowledge only using experienced and qualified instructors. So you can be sure that if you think of a different area we will know about it too. When you book we will give you the exact location of where we meet. 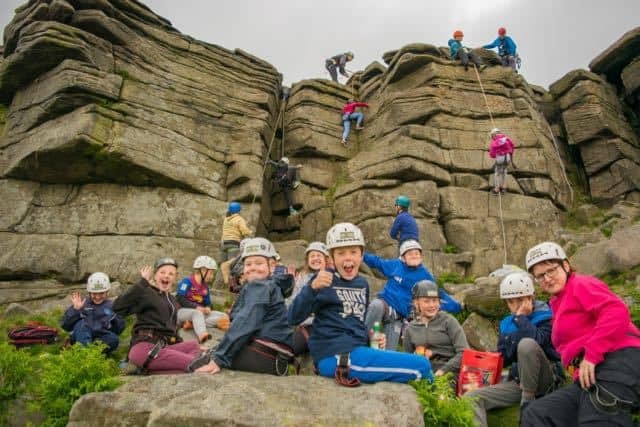 This will either be an easy to find car park or in the case of Stanage in the Peak District we usually meet at Outside, the climber’s cafe in Hathersage – the perfect place for a pre-climb cuppa! Only 20 minutes from Sheffield, 30 minutes from the M1 and within 1 hour from Manchester, Doncaster, Leeds, Bradford, Stoke-on-Trent, Chesterfield, Matlock, Derby, Nottingham, Huddersfield and Barnsley. Within 40 minutes from Stoke-on-Trent and the M6 and 1 hour from Sheffield, Manchester and the M1. Close to Settle, Skipton, Milnthorpe and Kendal and within 20 minutes from the M6. Within 45 minutes from Leeds, Harrogate, Bradford, York and the M1. Lancashire, close to Blackburn, Preston, Bolton, Burnley and Wigan. Within 20 minutes of the M6 and 40 minutes from Manchester. Within easy access to Ambleside, 35 minutes from Kendal and 45 minutes from the M6. Within 45 minutes of the A1(M) and 1 hour from York. Close to Middlesbrough, Whitby, Darlington, Northallerton, Durham and Hartlepool. 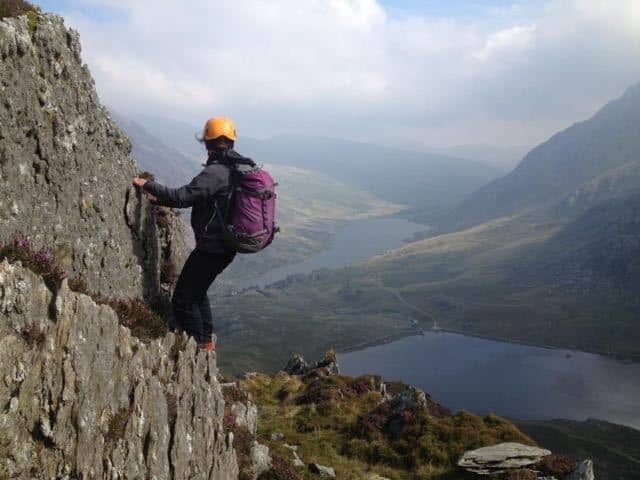 We can also provide exciting rock climbing adventures in other regions of the UK such as North Wales and Scotland. Call us on 01904 500094 or email us at info@lostearthadventures.co.uk to discuss where you would like to go. What about rock climbing overseas? If you are looking to head on an adventure expedition abroad why not try rock climbing as part of an adventure tour with Lost Earth Adventures in South East Asia! Whether you would like a day tailored towards school groups, company team building, a charity event, a celebratory birthday experience, or something a little more suited to Stag/Hen do’s (or something else entirely) choose from the following options to see how we can create the best experience for your group. We don’t act as an agent for other companies, so when you book with us you are getting a true Lost Earth Adventures experience from your first point of contact.As an outdoors provider, we have been doing this for many years, not only in England, but we have also climbed in many regions of the world. Our guides are some of the most experienced in the industry, and without a doubt the friendliest instructors around. They’re guaranteed to give you a fulfilling, fun and unbeatable experience. Our equipment is new, clean and the best available for climbing including helmets, harnesses, ropes and all the protective equipment necessary. Your comfort and enjoyment is our priority so we endeavour to find the most suitable climbing venue for your group and the prevailing conditions. We never rush and don’t believe in cutting any corners. We believe in giving your group not just a great day, but an exceptional one. This is your day and we’ll do everything we can to make it one to remember. Our instructors will also create fun and entertaining games for you while also providing an action packed activity. You will receive a fantastic staff to client ratio so that you do not spend a lot of time waiting around. 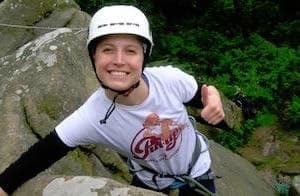 Our Lost Earth Adventures rock climbing leaders are fully qualified experts, highly experienced with knowledge of the best and lesser known climbing venues in the UK. We are passionate about the adventures we lead. Our guides love to share knowledge of the activities and it is highly important to Lost Earth Adventures that each member of the group has maximum activity time and enjoyment. We will cater to the needs of your group and we provide all the equipment necessary, so you can focus on the fun and excitement of a day out on the rock. 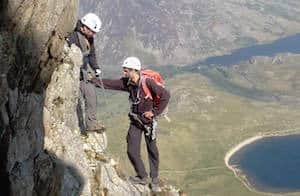 Our team are highly experienced rock climbing leader professionals, qualified first aiders and have expert knowledge of each crag we visit to ensure a safe, enjoyable trip for all.  Lost Earth Adventures also holds an AALA license for the provision of rock climbing. This is the highest accreditation that is available from the British Government and means that we meet the high standards set for providing adventurous activities. Read more about our safety policy. Our rock climbing leaders are passionate about ascending crags and mountains, and have climbed in remote regions of the world. From the grandeur of the Himalaya and the Rockies, to volcanoes of Latin America, the towering Dolomites and the limestone karst of South East Asia. We love to pass our knowledge to others and will answer any questions you may have. We will teach you how to climb safely and efficiently, and we will help you develop your confidence and skills to challenge yourself safely and make climbers out of you! See our team of expert guides! We offer both half-day and full-day rock climbing experiences which can be done in the morning or afternoon, rain or shine! We don’t have minimum/maximum group sizes and can cater for small and large groups. We maintain exceptional instructor:client ratios, ensuring that our standards remain high. Prices are for all experiences and courses except our learning to lead, scrambling and multi-pitch courses. These courses are only possible to do as a full day. *No more than 2 people with one instructor when multi-Pitch climbing or scrambling.The prices below are calculated for 1 instructor and if you would like more specific details then call us to discuss your requirements. *No more than 4 people to an instructor when learning to lead, however we recommend that this is done on a ratio of 1:2 as it is a better learning experience. 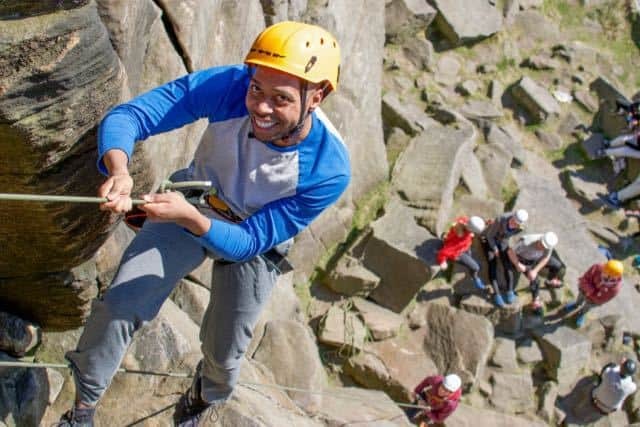 Make it a full day of adventure and combine an exciting rock climbing experience with a half day of caving and abseiling or gorge walking or mountain biking. Visit our rock climbing payment page to book. 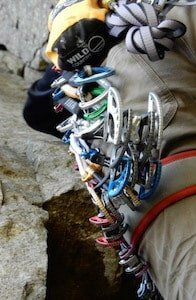 Click on the arrows below to take a look at rock climbing in the UK.